Associate Professor Youichiro Higashi of the Graduate School of Humanities and Social Sciences and Associate Professor Takashi Yorifuji of the Graduate School of Environmental and Life Science were selected to receive the 2014 academic year Okayama University Top Young Researchers, which is awarded to young researchers who have done outstanding work. 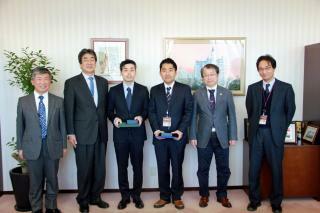 The award ceremony was on February 19 in the president’s office. The university judged nine candidates in terms of various factors such as actual work accomplished and future potential. Associate Professor Higashi was selected because his analysis of decision making theory in economics, particularly subjective uncertainty, was highly praised, and Professor Yorifuji was chosen as a result of his highly-rated research on Minamata disease, air pollution, arsenic, and paediatric and perinatal epidemiology. The prize was first awarded in the 2007 academic year in order to develop young researchers who can make active contributions on an international level.